If you store your IncrediMail email messages in custom folders, you expect to find them there. What if the messages are missing because the custom folders are nowhere to be seen in IncrediMail? Not all is lost. IncrediMail can lose track of your folder layout without losing the folders or their contents. Bringing them back is usually easy. IncrediMail stores your folders and messages on the hard drive of your computer, but at times, a file is generated that causes the missing-folder glitch. To restore everything, you find and delete that file. Here is how to do it. Open the folder with the long ID number. 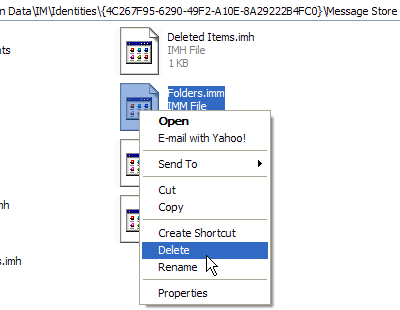 If you have more than one folder with an ID number, perform the steps below for each. All your custom folders and the files they contain should be back where they belong.